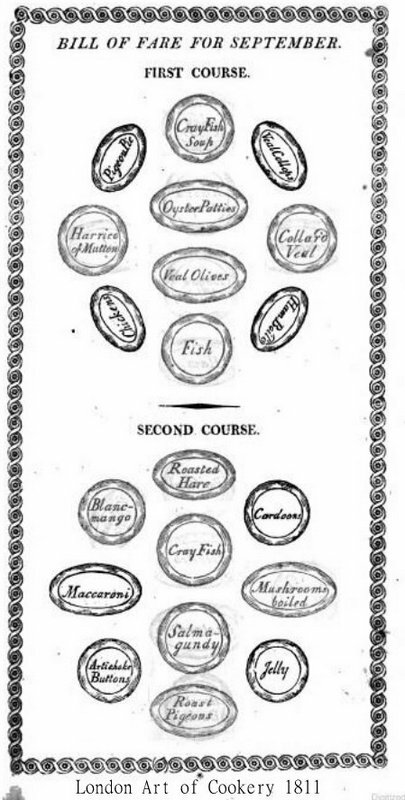 When I came upon the listing of courses, I’ll admit I was a little daunted, even though I’ve encountered far more elaborate 19th C menus. But when I saw the map of the table setting,* I wondered where the people were supposed to fit. 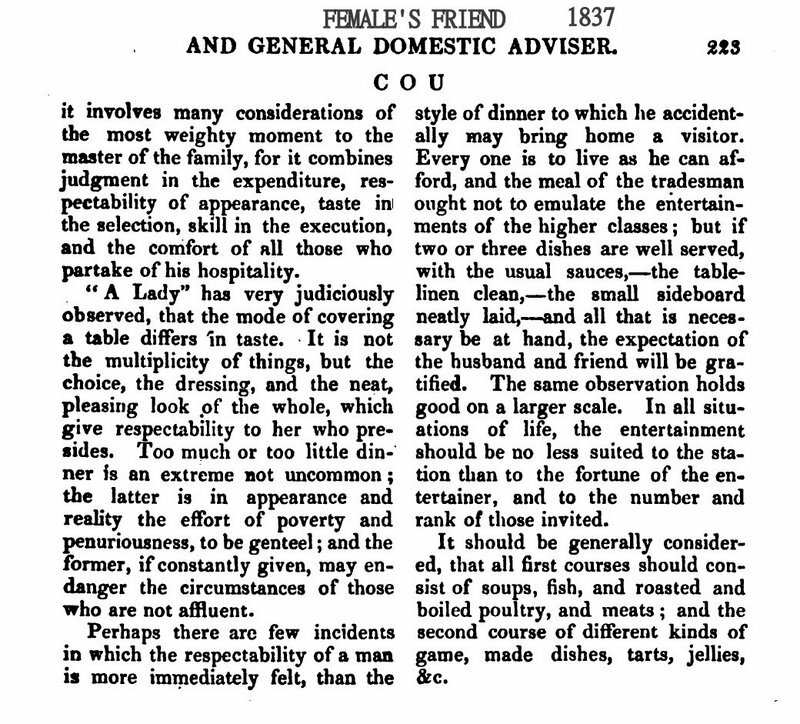 In any case, as the advice makes plain, the courses depend on what the host can afford as well as who the guests are. *You'll notice that the table settings don’t match the September menu. This is because The Female’s Friend didn’t provide settings for every month. 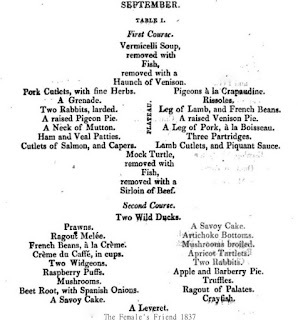 However, the 1811 London Art of Cookery table setting for a simpler September menu comes close. 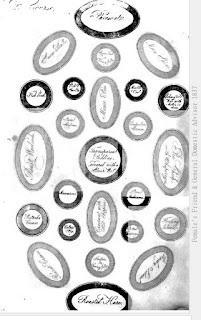 Black & white images courtesy Google Books. Photograph of table setting at Victoria & Albert Museum courtesy me. 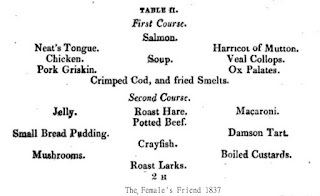 At this early dare, meals were laid out and served in the style we would now call a buffet: guests simply helped themselves. Also, like a buffet, all the 'courses' were placed on the table at the same time. That's why it seems so crowded. I expect the diagram is meant to show only the centre of the table. The reader would assume places for the diners around the edge. 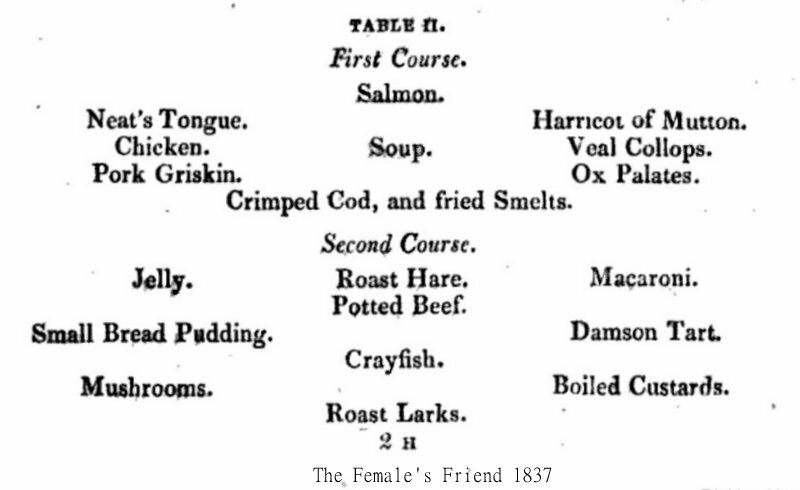 The huge range of food had two purposes: to display the host's wealth and generosity, and to make sure every guest could find something she or he liked. For a demonstration of this in action, see the BBC programme by Prof. Amanda Vickery recreating the ball at Netherfield from Jane Austen's "Pride and Prejudice". In that, dinner is served in precisely this way. Mr. Savage is correct. Only the center of the table is shown in the diagrams. There would have been plenty of room for the place settings, which readers at the time would have understood. This kind of service was also more "social". Guests were expected to share and serve the dishes nearest to them, and to ask their neighbors what they wished. 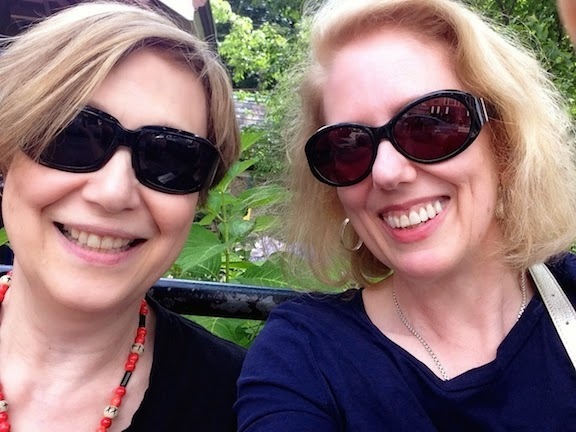 It all encouraged conversation much more than the later style of service, where guests waited for servants to help them, a much more formal and less convivial arrangement. 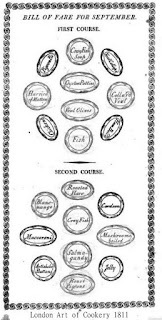 I see that there are 2 courses listed, however, which implies to me that servants must have cleared away the first course and brought in the next. Is that right? 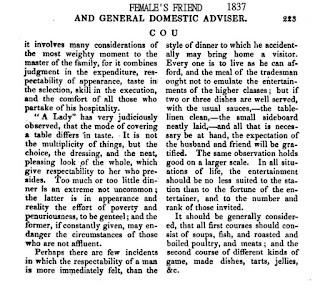 The style of dining described above, where all of the dishes were placed on the table in an attractive display, was called service à la française. In the 1830s, it became fashionable in Paris to bring the dishes to the table sequentially and serve them individually. 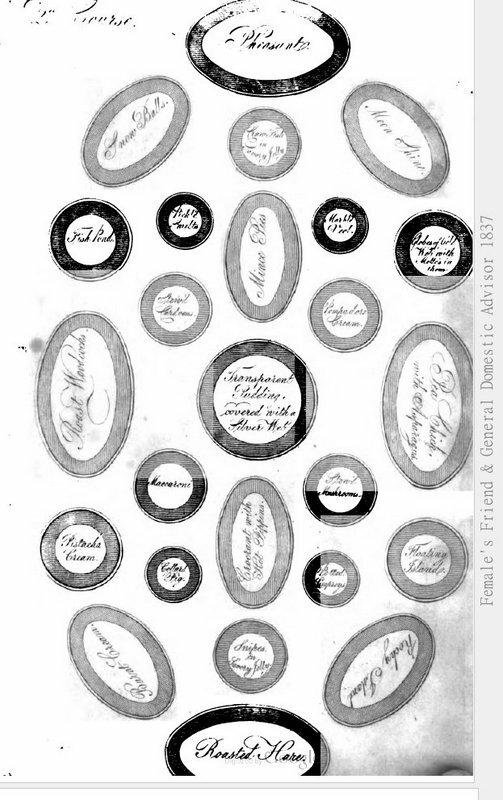 This process was called service à la russe and the new style was soon adopted in London and then New York, just as the earliest hotels and restaurants were being established. 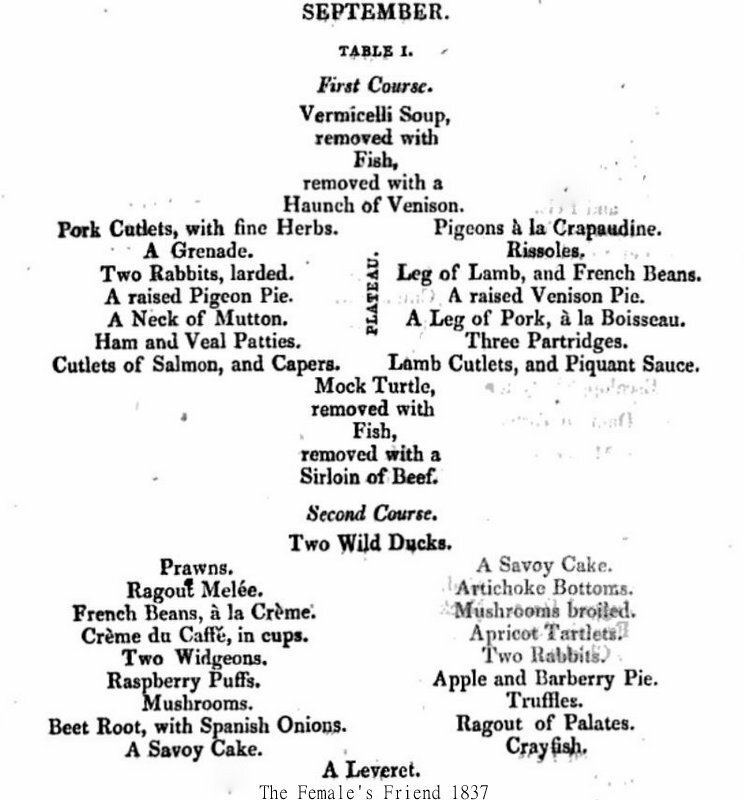 Menus generally did not exist until about 1840, when they were suddenly needed to facilitate this new way of dining.